These three photographs show the NSSL, DoD. NSF, Raytheon, Technocratic front; NASA’s Radome system at McMurdo Station in Antarctica. Look at the glowing, pearlescent skies. Yes, AMAZING! Amazing Ozone Negation at work, the stuff of the Eugenic Technocratic Agenda. 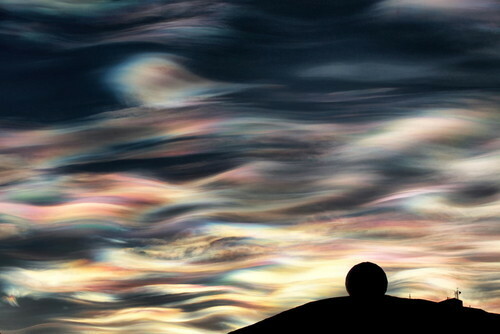 This deliberate multifaceted Op has created the region’s annual Ozone hole. It is not a hole per say, it is the – thinning – of the Earth’s protective barrier. This allows the passage of UV Radiation sourced from the sun. UV A, B, and Deadly C uptakes are enabling massive die offs, cancer increases, and the onset of sterility. That is a snippet of the totality of this perverse research stations true function, not the NSF’s propagandized penguin research or sea ice degradation – an article for another time. Ozone Depletion…! Doesn’t it hit you as odd that the NSF and Raytheon share the same offices? 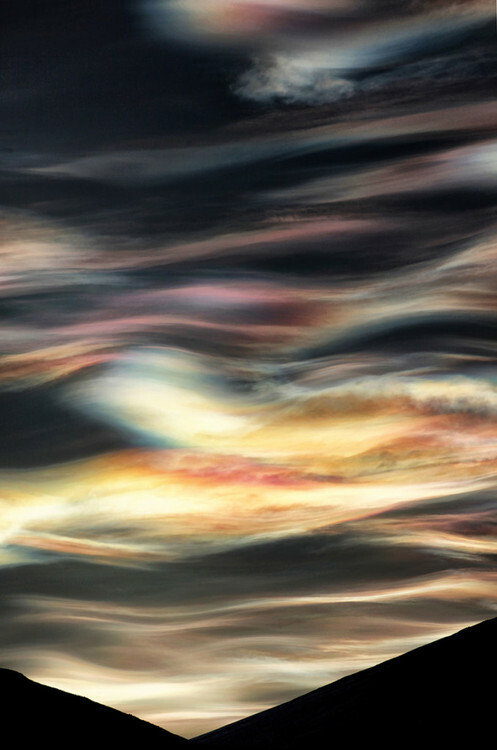 These images of Nacreous Clouds, originally named PSC’s, now labeled Mother of Pearl Clouds, is not an image of beauty, it is a harbinger of Death…! 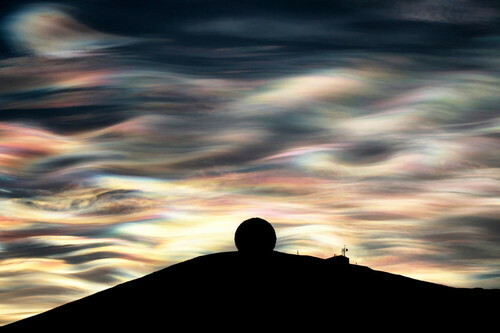 These nacreous clouds the PSCs – Polar Stratospheric Clouds – and get their brilliant, rainbow colors from sunlight that is reflected from below the horizon. The clouds are so high — up to 82,000 feet above the Earth — that they continue to glow in these incredible hues long after the sun has gone down. Unfortunately these clouds also contain nitric acid, which reacts with chlorine that’s released by industrial processes, NASA Space Shuttle launches, each one emitting the equivalent GHSs that would take 100 years worth of US vehicular activity and that combination of chemicals rips or ozone to shreds. So this cloud may be beautiful, but it’s also destroying the atmosphere. 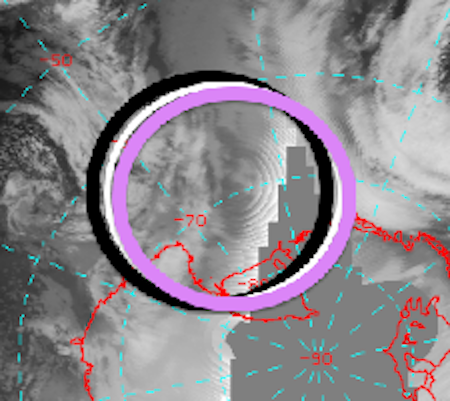 This story goes to these images and events from todays satellite and Radar images of the Antarctic region. 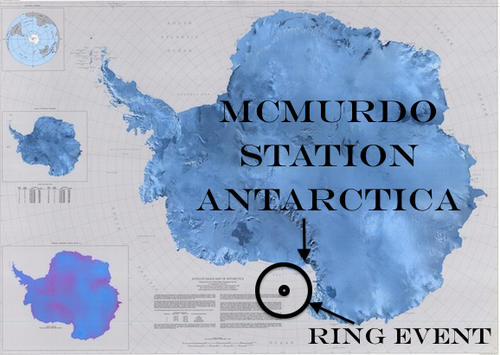 I have used many open source images from McMurdo Station over time. There is an Ionospheric Heater – a.k.a. 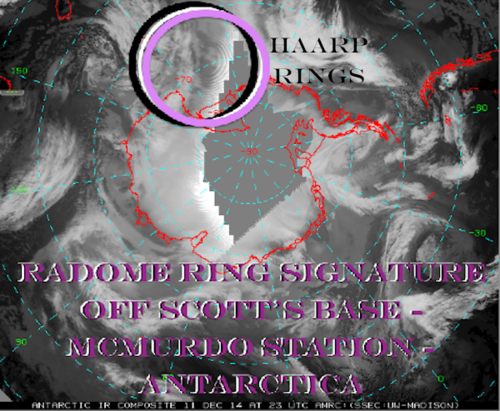 – HAARP Ring satellite signature just off of the continent adjacent to McMurdo. This is one of the US locations, in the Antarctic, which has an R and D agenda, centered around experimentation the Radome that you see imaged above is the core tech. There are other systems that complement this next generation type installation. 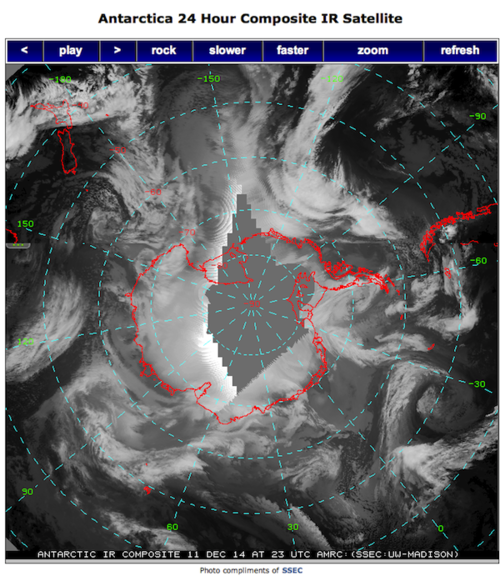 Here are satellite images of both the IRI Ring and composite maps of Antarctica. The map of the southern most continent is often turned 180 degrees, it is flipped to its antipode direction. 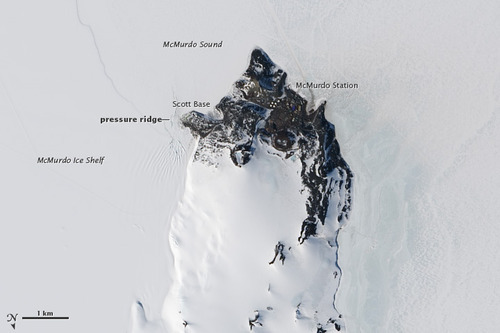 A larger image would show that McMurdo Station is located two miles from the historic Scott’s Base. It faces New Zealand where supply flights originate. There is an annual supply operation which brings goods and 8 million gallons of fuels. Antarctica has a no nuclear power plant treaty. It was discovered that McMurdo had a nuclear reactor in use at the installation… So, what became of it? It was finally decommissioned and then it was, as have many other units, thrown into the sea! The link above talks of natural background Plutonium levels on the ocean floor! Plutonium is manmade! It was first created in 1941! 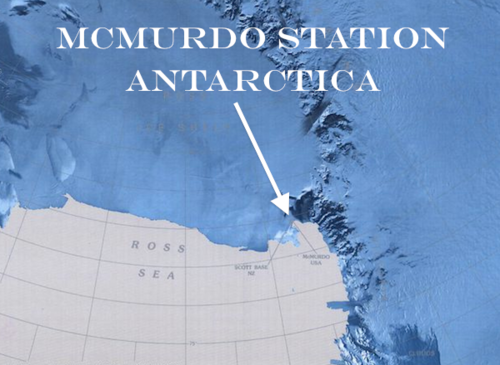 The DoD has taken control of Mac-town with the DoD, US Navy, Air Force, US Coast Guard, NSF, et al.. McMurdo Station is Antarctica’s largest community. It is built on the bare volcanic rock of Hut Point Peninsula on Ross Island, the farthest south solid ground that is accessible by ship. Here are the time stamped images from SSEC imagery, with maps inserted. Many are under the belief that HAARP, now labeled IRI, does exist, it is Operational. The spin regarding it’s decommissioning near Gakona, AK is spin. Its Array has doubled in size and is online. One of eight locales where such installations exist in AK. One need understand, coming to grasp the fact that these Frequency Generators are Globally Ubiquitous. There are many that are of dissimilar designs. They go by different acronyms, are not seen as functionally one and the same, yet there is a Future Weapons Arms Race Here and Now! In the case of McMurdo’s Radome and all of the Radar equipment there; Raytheon has had the contracts beginning to end. The National Science Foundation and Raytheon Polar Services Company are housed in the same building. For years the station has grown. It can house 1258 personnel and an average of 200 winter over. Todays Heater Event shows the ongoing agenda which ties deeply to GeoEngineering, Weather Weaponry, Ozone Negation with its disinformation taxation campaign regarding CO2. For your consideration… otterwalks: 12th December 2014. Note: the above article was edited 29th August 2017. Should you ever find a defect in image presentation, please let me know and it will be recoded. It is a constant battle to keep both written and imaged data from censorship via corruption of the source code. Crew… Holding down the Fort in o…s absence. Soon it will be o.. and Crew. P.S. Join us on MINDS.com. This entry was posted in McMurdo Station and tagged #DARPA, #Dept of Defense, #E. Pollution, #Eugenics Agenda, #HAARP #, #McMurdo Station. Bookmark the permalink. For some reason the link has gone to the wrong video? Greetings Kelvin, Personally I think all of your work has merit. I would hate to delete the quote wrong video. If you wish I will. For Now it may stand of its own so that more will see Weather Modification Ops having been captured. I have not researched the timeline so I cannot confirm any specific Extreme Weather Event from this Op. @ Kelvin Telford, Thank you for your time and efforts. You must forgive me as I could not get the CC or audio feed on your video. I am hearing impaired. From the visuals, I see what appears to be what is generically called a roll cloud. This is indeed electromagnetically induced. This is a link to a WeatherWar101 Video about this event crossing the US. It is the creation of numerous installations overlapping various wave forms or field interceders. I will look at your other notes in a moment. Thank you again for taking the time both to create your work and to comment here. I’ve got some pics of McMurdo ground level with what I’m certain is an array in the background. Lemme send em to you. Greetings Steve, Always looking for new imagery and data. How would you accomplish sending images. I am terrible about email, don;t use Facebook nor Twitter et al. You can find me at the same name on Tumbler, my -Ask function is online. We can work it out from there. You can try emailing to otterwalks@gmail.com; though my lack of devices and online time may cause it to take a while to respond.